A Visibility Matrix (2018) is an ambitious, video-based artwork, initiated by Sven Anderson and Gerard Byrne. The work assembles contributions from an invited panel of artists, film-makers, anthropologists and others within a synchronised, multi-channel video installation in the gallery space. The appearance of the video contributions in the exhibition is shaped by an algorithm which assembles and edits the material live. The work is speculative in nature, testing the limits of the gallery as a space for live production, and the possibilities for video to operate as an active signal rather than a passive image. In this conversation with Rachel Donnelly (Assistant Curator for Learning and Engagement at The Douglas Hyde Gallery), Sven and Gerard discuss some of the ideas they were thinking around throughout the development of the work. Rachel: Something that’s interesting to think about when looking at A Visibility Matrix is the origins and context of the hardware, the screens, both the old CRT monitors and the newer flatscreen monitors. These screens are not just a medium for the video material that’s part of the work – they’re an integral component of the work itself. They’re sculptural in the space, in their arrangement. And in terms of aesthetics, they’re the part you’ve made decisions about, whereas you don’t have the same control over the aesthetics of the video content. Gerard: I think what’s important to note in regard to the screens is that the work is very interested in a broad audience. The older CRT monitors are from a video wall, and so are the flatscreens. They’re the same as the video wall you see when coming in the Nassau Street entrance of Trinity. It took us weeks to choose those screens. And I realised in hindsight what was at stake in that particularity – they’re public address monitors, they’re not domestic, they’re not something you’d have in your house. They’re made for train stations, bus stations, airports… I think what’s significant about that is this idea that the work addresses the gallery as a space of public address. So the work treats the gallery as a public space. I think that maps over very clearly into the sporadic voiceover in the work, because that voiceover addresses a public. What it comes back to, at least for me is that, when I was a teenager in the late 80s and interested in art, at that time photography and video were not things you saw in galleries. And when you did seem them in galleries, they were quite alien. And now, 30 years later, that’s something I’m quite interested in, that I think is something that needs to be retained, insofar as you can retain something. I like the idea that the work has a sort of otherness to it. The material has an indifference towards the gallery. Some of it was made to be shown in galleries, but we were really looking for material that wasn’t made to be shown in galleries. R: When I was thinking about a way in to talking about the work, a question that occurred to me was: what were the decisions you made, and what were the decisions you didn’t make, and continue not to make? Participation seems like something that’s quite central to the work, both in the way it’s structured and in the ideas it’s looking at. You invited the participation of your contributors and the remit for what they contributed was relatively open. And the work reflects on the idea that we all, to a greater or lesser degree, are participating in the creation of public imagery. G: When we started, the project began in a very pragmatic way. Sven and I had been working together for years on shows. It was work of mine, but we were working in a very complex, very collaborative way where Sven had massive amounts of input. And there was always something about the format of what we were doing that didn’t do a very good job of representing the background work we were actually doing. At some point, we decided to apply for an Arts Council grant together and come up with an idea that addressed this structural blind spot. Sven: That’s what was kind of natural about it, really all the work had already been done. We’d been having this conversation for years. So it was a question of finding a structure for this. G: I think what’s important about that moment of forming the project was we got into this thematic that was about the idea of images and networks. And we thought about the idea that the camera, any type of camera, is somehow a tentacle of a network, a techno-infrastructual network. That was something we were interested in actualising, making visible and working with. Often it seems to have a pervasive invisibility to it – a pervasiveness, and therefore an invisibility. We realised that we were interested in conditions, and conditions can be very hard to quantify; technological, cultural, sociological conditions around images and how we relate to them and how they circulate and how their circulation implicitly alters how we think about them. We could have made a film about that idea, but we went on a different route, we went on a route that was more about trying to establish some sense of conditions through a multiplicity of samples. If we ask a lot of people, develop a network of something like fieldworkers, then we can aggregate a lot of samples, a lot of materials, and then we can bring it all together in a configuration and that makes certain types of conditions palpable. S: Yeah, not comprehensive. It was never that by having all of these perspectives, we were going to achieve some conclusions. R: For me, and this association probably has a lot to do with my own background and interests, the way the work was constructed and the way it’s structured reminds me of how devised theatre, or collaborative performance, works. That the director or choreographer creates a set of conditions within which material can be produced by the performers themselves, rather than a director or author telling the performers specifically what to do. G: That’s a good analogy I think. If you think about a playwright and a script, I’ve always had this idea that the script is contractual in a way. We’ve authored a structure at some level, and insofar as our names are associated with the matrix, what we’ve authored is that thing as a structure, which we’re calling A Visibility Matrix. And then there’s a certain performativity to it that’s analogous to the role of actors or performers and you might understand the contributors in that vein. They’re almost like actors, there’s a performative character to it, and I think that’s reflected in what our our engagement with the contributors has been. We essentially wrote a text that was a statement about our sense of what was at stake in this project and we sent that to them, and then we asked them to give us a contribution in response to that. It didn’t really matter to us if it was something they made especially for this, or something they already had. At some level there was a delegation to them, a delegation of judgement. It wasn’t an open call, or a juried selection type situation – we didn’t appoint ourselves as arbiters of what’s in and what’s out, we evaded those types of relationships. Obviously we want a certain substantive engagement, we want people to be serious, but the best way to do that is through how we engage with them. S: Using the words ‘editors’ and ‘contributors’ is funny at this stage, because that was our backend logic for organising the project in the beginning, and it’s come to the surface just because of the working model and wanting to communicate about it. It’s accurate enough… I think Maeve [Connolly] was saying the other night that an editorial board is relied on as this structure to pool knowledge. We invited more people than we see on the list right now to work on the editorial board and it was a really diverse group of people, and their role was to recommend other people, to bring in people from their networks they were interested in. All the people on the board, we had specific reasons for asking them. We asked people who are actively thinking about these ideas too. And at a certain stage within this we became interested in inviting people ourselves, not because we thought there was a gap, but because it was exciting. So technically we’re part of the editorial board too. R: Something I think is interesting is this idea of adding categories, or tags, to each piece of video content, in order to allow the algorithm to process it. And these are generally single words, based on the main visual feature in the video, e.g. ‘animal’ or ‘car’. And I think there’s something interesting in the fact that this is the level on which the algorithm is engaging with the video material, which is a very different level to that on which visitors to the exhibition, people, experience the material. The algorithm deals with a single unit of information, a word, whereas a human experiencing the exhibition can have a whole host of emotional responses, memories being triggered – a much more complex and rich interaction. What was the thinking behind using these categories? Are they just a technical necessity? S: We’ve opened up this channel for people to submit contributions, everything is coming in, and you can hold yourself back from trying to organise it in the beginning, but there’s a moment where you do have to start wrestling it into a more manageable form. It’s not just editing and composing these things, it’s also viewing them, and that takes a lot of time. Those categories become the kernels of our first moment of observing what the matrix is. R: What do these very refined, very singular points of information, the categories, tell you about how we’re receiving imagery? G: I think what it tells you is that actually words aren’t accurate to the image saturation we’re experiencing; our language has been overwhelmed by imagery. We have this historical hierarchy that words come first, and we invest authority in words, historically. But the truth of the matter is that the moment we live in now is really dominated by images. And so what we have here is not an attempt to somehow depict those set of relations, because that’s not possible, but what it is is symptomatic of those relations. There’s a level at which the work is actually symptomatic of cultural conditions – and that goes back to the original endeavour of the work. And one of the things that’s nice about that idea of being symptomatic or reflective, this kind of way of thinking about an artwork, is that the Juan Downey work is a wonderful reference point. I think what’s really useful to us about the connection to Juan Downey is that there’s historical perspective on his work. Unfortunately, he died relatively young, but that means there’s a sense in which the work is very much tied to a period and there’s a sense in which it’s quantifiable. And so as a result, it’s quite possible to have a kind of historical perspective on it, which is that it existed in this space between art and anthropology. And this is a useful perspective to apply to the project we’ve done. There’s a certain sense in which the project attempts to make connections beyond the paradigm of the interests of art as a field. S: Well, it’s very explicit in what we set out to do. It’s important. It wasn’t just about contacting artists to give us artworks. Naturally there are a lot of artists involved, because that’s our primary network. But it needs to open up more, it wants to open up more. G: I’m really thinking about the idea that the image, the lens-based image, whether it’s a photo or a video, is something that, even though it’s very familiar as an artistic medium, has a radically different genealogy to an oil painting. We can say an oil painting is absolutely bound up with the history of art, as is a watercolour, or bronze. But you can’t say that about an artist who makes photography or works with video because those formats and technologies are driven in their very existence by… those screens wouldn’t exist if there wasn’t a need, a need which is fulfilled by, for example, that video wall outside the Gallery’s front door. That’s what drives it. And that’s profoundly different on some level. I’m not saying it’s better or more important or anything like that, but it is important to recognise difference. R: Well it’s definitely a more widely experienced interface, if you want to call it that, amongst the public, than, say, an oil painting is. S: And so it is familiar. So this whole infrastructure, at least in terms of how we imagine the moment of encounter, coming around and looking down on it or being immersed in all these screens – there’s nothing spectacular in that. It is a very common moment to be surrounded by screens in this way. Not with this exact geometry, not with this exposure and certainly not with this density of imagery. For us this is a chance to achieve something that could be achieved in other places but that isn’t achieved in other places, because those kind of infrastructures out in the world don’t have that imperative. There’s an attention span that’s lacking on some level. I don’t think it’s the public that’s lacking potential attention for this. I think this is a very open thing to encounter. It is familiar. It should be familiar. R: It’s familiar, but it is also making the familiar strange, as you say, by its construction. Even the cabling is unusual. I was interested in something Nikos [Papastergiadis] said in his talk ­– I’m paraphrasing but – it was about the act of participation becoming commodified through social media. We’re all ‘content creators’ now, for brands. The way you’ve assembled contributions for A Visibility Matrix has echoes of the way in which social networks function. G: It’s a charged area. We just had a referendum and we had all this stuff around Facebook and Google and trying to, at least superficially, restrain their influence on the voting public. And the interesting thing was they apparently self-regulated. There’s no regulation on a state level. And of course, there is a sense that actually they’re probably the biggest influencers, and it’s a matter for debate about whether they were or not in the end, but there was a sense that these are the great influencers in terms of contemporary culture. And we’re miles behind in our understanding of them, both on a legislative level, in the sense that governments don’t know how to legislate for social media, and also on a cultural level – the reality of technology is that it precedes culture in a way. And business opportunities for the most part drive that and then our understanding and our critical reflection on it lags quite a way behind usually. And I think sometimes that type of anachronism, of the critical perspective and the fact that it’s always late, can be turned into a useful occasion. There is something paradoxical in our proposition of doing the project we’re doing, that supposedly has this kind of outward-looking character to it, that we’re actually lapsing into the context of The Douglas Hyde Gallery cave, because it’s a very anachronistic space – galleries are anachronistic. But on another level, you realise there’s a specificity to it and there are specific possibilities in that space that seem to be precluded in that space out there, for example. And so I think that’s the weird complexity of working with media, and these types of interests, within the paradigm of art. Which is that, for the most part, art is kind of anachronistic as a field. R: Yes, and I think that’s the level on which it operates. I was reflecting on how the body is implicated in the exhibition, and how that’s really unusual when you’re dealing with screens. I think our day-to-day experience with screens is a very disembodied one, where we forgot our bodies when we’re on our phones or computers. S: Yeah, and even more so when there are other people in the space. I remember when we were setting this up, Jennie [Guy] sent us some pictures of video wall monitors at an event, rows of screens, nine or ten up in the air, far away from where she was standing. You don’t really get a sense of them – those things are up there, you’re down here. And there is something to be said for bringing them down to this level, and walking around behind them. The scale of it, which is kind of fixed, that 55 inch unit. And we did a lot of research about the exact size of the monitors. Once you put them on the scale like this, there is something really compelling about being able to be behind them or in front of them, seeing how they join each other at right angles. 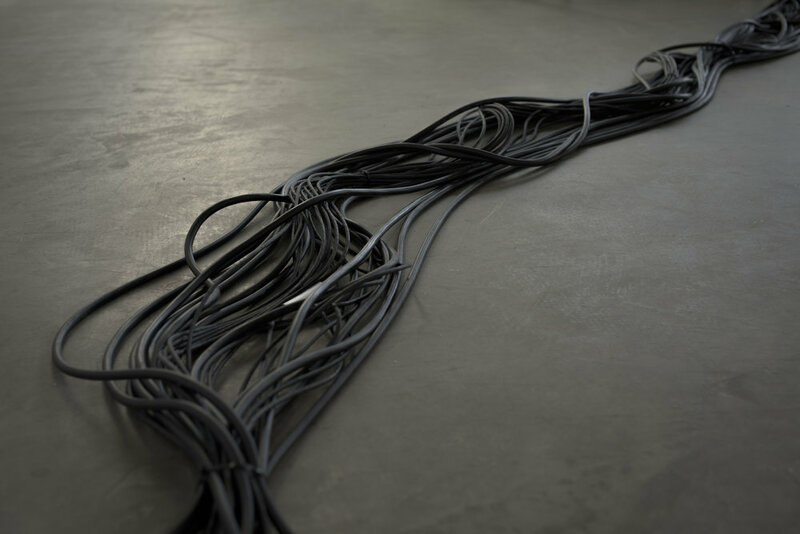 R: Yes – and the whole installation has a surprisingly organic quality to it, with all the wires running along the floor and up the walls. They almost look like entrails. And it’s surprising to see wires now when the emphasis is so much on everything being streamlined and wireless today. S: It’s also playing with your peripheral vision, which is this really important forgotten sense. For us, this has been a realisation over the years working with mult-channel video, thinking about things that are happening in the foreground of your vision, things that are happening behind you. Getting away from the idea of one cinematic image that convinces you that it’s surrounding you, and playing with these kinds of things that are actually much more spatial. There’s something very primal when we feel light changing behind us in perfect sync with something right in front of us. It’s very animal. G: The physicality of it is very important and it’s interesting to see people respond to that. There are all sorts of different layers to it – there’s a sense of the gallery as a space of actuality. And I think that we’ve taken a symbolic model of a network, and I think the cabling is all part of that – there’s the sense that the images come from somewhere. And then there’s also the multiplicity of address, the fact that the screens all point different directions, I think that’s also important. I was talking to someone early in the install process and they said ‘Why don’t you set them all up facing the same way in the gallery?’ and, quite apart from what that would do for the sound, that sets up a relationship between the body of the viewer and the matrix that’s very specular, very much about looking at an image, a giant image. And I think what we have here is something that’s much more about a type of inhabitation. I think we’ve set up an arrangement here that implies in some sense that we cohabit with images. S: And what’s the reaction to it? By setting this up and starting to articulate the patterns we’re seeing out there, where it is really about light sources sometimes, as much as it is about the images themselves. I don’t think we’ve resolved the viewing infrastructure in that way, except in that it’s keeping people moving. I feel like it’s doing that really successfully right now. There’s no privileged position. Even I was a little bit worried at first that coming in from the balcony here was going to give you this overarching narrative, but I think even with that, there are too many questions. We’ve broken that in a few ways. And I’m actually glad we did this broken array coming out of the Juan Downey piece in Gallery 2 to contrast. I think that gives a certain gravity to something else in the space that offsets the sense of ‘I’m going to look out into the main gallery and see this one thing’. I think the two are actually working really well together, spatially. R: But even from the balcony, you can’t see some of the screens, you’re only seeing one side of an object, so you have to walk all around it. The cabling is a very explicit analogy for the conditions of how imagery is circulating, but it also does bring you back to your body all the time because you have to step over it. S: Yeah, it’s infrastructure and it’s inconvenient. You might not expect it to be there, given that these are wireless days, so it begs a lot of questions. Which are all very explicitly linked to how the work needs to perform as a network. You could not achieve the precision we’re looking for very easily in a wireless network, so the cabling is necessary to the way it behaves. R: And I guess that touches on what Victoria [Brooks] was talking about in her presentation, about the infrastructure of the production of video imagery. G: I found those two presentations  remarkably symmetrical in a way, even though they were coming from different places. Victoria is focused on production and Nikos is focused on reception. As I said to both of them afterwards, what struck me is the sense of precarity around both production and reception. Making things is always precarious, no matter what you’re doing. Shooting an episode of Game Of Thrones, that’s precarious. I think what’s distinct about the way artists work with these means of production, and also the means of distribution or reception, is there’s a certain acceptance, in some sense a productive acceptance, of the idea of precarity. And provisionality. So with people making Game Of Thrones, no matter how precarious it might be, the first thing to do is to hide that in the realisation of the project, and the second thing to do is activate this machine of dissemination and distribution that’s all about closing down meaning, in order to monetise. And I think that’s something that’s different about the way artists are working, and it’s a sensibility or a certain ethics. It’s the idea that in this instance, all the screens don’t face the same way because we actually want the viewer to walk almost into the screen, to walk into the space of the screen. Rather than trying to reinforce boundaries we’re trying to dissipate them on some level. S: And that’s back to what you were saying about the symmetry in Nikos and Victoria’s talks. Where I felt again, it was great that the talk happened as quickly as it did after the opening. I really got a sense of where the project is now. It’s right between this space of production and space of dissemination, and display. It’s not just about the fact that there are going to be more edits, but literally it is an editing system, literally we’re seeing it for the first time in this way. And this exhibition in The Douglas Hyde is the first time we can start to work on it, and I think that’s palpable in terms of what people encounter. And that’s what makes it a generous system, it’s not determined. If it does open up to a sense of participation as well, it’s asking people to participate in something that’s unfolding. It’s not speaking to people as though it’s finished at this stage. R: Visitors to the Gallery are always really curious about how much material there is, how often it changes, how long does each cycle last. S: Even already it’s not repeating. There’s enough material that we’re not even seeing all of it. And the material’s already in the system, it’s just not really manifesting right now. It will slowly start to manifest as we start to work with it now, and then in terms of different permutations of the material, it will start to proliferate over the time here. G: So we received all this material from contributors and it was all fuelled on the back of multiple conversations we had with people over the spring to steer them. Those conversations happened on different timescales. In some cases they happened really quickly, and were very short, whereas some of them have gone on and on. As a consequence, although we received a lot of material prior to the end of May, there’s also lots of significant material we either didn’t receive until this week or that we still haven’t received, but are confident we will. We had a certain cutoff point, a pragmatic cutoff. We took the material we received by a certain point and we put it on the media players, and so that material becomes the body of material we have to work with for the permutational edits we use. And at a certain point, we’ll actually take a moment to add more material to all the players. You have to physically load the material onto each one. The system we have now allows us to produce lots of different edits of the material that’s on the BrightSigns. We have a certain number of edits that are in play right now. S: Right, but just to clarify that, what we’re seeing down there is not just edited video, it’s video that’s being edited while we see it. So when we talk about changing it or starting to train it to act differently, the media out there is the same, but it starts to behave differently. R: Are there theoretically an infinite number of edits? S: It will get to include more and more different levels of indeterminacy and then intelligence as it moves forward. Will that happen at The Douglas Hyde Gallery? In small stages, in small doses. First you’ll just see more edits, and then sometimes it’ll do different screen arrangements of the same temporal material, and then work with the voiceover elements in different ways, and then by the time it goes to France it’ll have more intelligence. That’s what I mean, it really is a production environment here for us, as much as a display environment. R: So does the audio always play in sync with its corresponding video? Or are these elements sometimes separated in the work? S: Sometimes you’ll be hearing audio for a clip that’s playing elsewhere in the sapce, but you can’t see it. That’s the fun of working in the space this way – you’re withholding certain perspectives. R: And the voiceover, that was scripted? G: Yeah, it’s scripted and that is something we’ll do more work on but the idea of the voiceover underscores this idea of public address. We always jokingly refer to it as our Hal 2000 voice, from 2001 A Space Odyssey. It’s the voice of the system, so to speak. So sometimes it corresponds directly to some of the material that’s playing and there are other times where it’s interested in the space of The Douglas Hyde. Or it’s interested in the physicality of the system. S: It’s aware of all these things. G: It’s about connecting different realms. What’s interesting about that voice figure is it connects realms, it connects the Eiffel Tower to the Douglas Hyde. It’s not really talking about the Eiffel Tower, it’s talking about the names written on the side of the tower, which appear in one of the videos. So it’s actually reading the material, it’s reading words that are in the image. And that’s something the voiceover does quite repeatedly. We have this material we got from Nigeria, of highways, and a lot of the footage seems to depict billboards beside highways, so the voiceover reads what the billboards say. And that’s an act of reading the image. So it demonstrates it has an intelligence in relation to the images. It has the capacity to read them. The voiceover is really about bridging those different spaces, this space and the space of the highway in Nigeria. R: It was a speculative work when you started; where has that speculation led? Have there been surprises? S: Surprises, no. I think all of the conversations have been generative. I think receiving material in itself is extraordinarily generative and bringing it into this possibility is very generative. I guess there was a curiosity about whether or not this would be palpable, the idea of talking about these conditions and bringing this material together. I wondered what would rise to the surface in all these intersections. And observing what is happening out there in the gallery, it’s satisfying to see more questions arising. G: For me, the best answer to that question is to say that we couldn’t have had this conversation if we hadn’t made the work. So in that sense the whole conversation is testament to the generative character of the work. And it’s also because it’s fresh, we’re all still teasing out our relationship to it. And because it has this capacity for further revision. All these things means it’s sort of an open work. G: There’s no doubt about the fact that theatre and performing arts in general is a very important and influential paradigm in something like this. S: Which has to do with time, right, more than anything else. The fact that there is something real-time about this, that’s evolving. There’s no simple loop structure that holds an integrity here. It’s literally evolving that way. G: In the evolution of our collaborative endeavours over the years, which began in the early days with me asking Sven to help me figure out technical things I was interested in doing in terms of the presentation of video in gallery spaces, we went through long processes of teasing that out. But one of the things that became clear after a while, is that with a lot of the things we needed to figure out, a lot of the solutions we found came from theatre. And they were technical solutions, but we realised people in theatre were doing something very similar to what we were interested in already. So that’s anecdotal on one level, but on another level it’s not just coincidental – on another level you realise it’s symptomatic of a number of things. One is the affinity of the project to theatre and performing arts in general in terms of sensibilities. The second one is probably our realisation that we had something of a blinkered mindset. We keep finding solutions in theatre but we don’t realise that actually, that’s not just a series of coincidences. You realise that what we’re working on is a kind of theatre, at some level. There’s long histories of connections, both within my own practice, but also in terms of the history of art I’m interested in. It’s interesting because film is really different. It’s kind of bizarre in a way that we’ve made a work that’s all about moving image and distribution, and with a budget that’s closer to some sort of film production, yet neither of us filmed anything. We had no input on that level. S: It’s incredible how generous people have been with their material and their time, with trusting us to use their material. There’s been a lot of trust along the way. There’s also a sense from people we’ve spoken to who work with video that they’re hungry for this, hungry for changing the conditions of how video is received in the gallery. G: I think that’s really true, and it’s been surprising. Victoria Brooks and Nikos Papastergiadis both presented on aspects of their research in the context of A Visibility Matrix on June 12. Both Brooks and Papastergiadis were members of the editorial board for the project. Image: Sven Anderson & Gerard Byrne, A Visibility Matrix, installation view. Courtesy of the artist and The Douglas Hyde Gallery, 2018. Photography by Louis Haugh.